I had listened to several later Genesis albums before delving into their past, and though I knew that this was going to be different, I wasn’t expecting to be met by a slightly wobbly, solo vocal line to open the album. It’s as brave an opening as I’ve ever heard, and once I’d got over the surprise at it I fell in love with it. 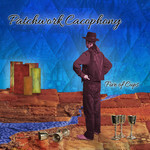 The album unfolds gently, step by step from this unassuming starting point. Not with a sense of anticipation and drama, but with a gentle sense of wading in until you suddenly realise you’re in the up to your neck in midst of the first, frantic instrumental section two and a half minutes in. Dancing With The Moonlit Night continues on its course, changing mood and feel and then, almost as surprising as its beginning, it finishes with a serene two minute fade out over pluckings, mellotron strings, flute and all other manner of other textures. 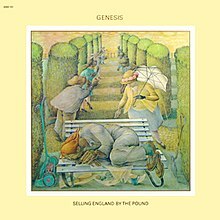 Like a lot of early Genesis it is full beautifully melodic shadings and interplay between the lines played by Banks, Gabriel, Hacket and Rutherford, and some fabulously creative, intricate and just plain musical drumming from Phil Collins. None of the many changes in feel or rhythm seem to be abrupt or out of place. I Know What I Like is a single, but it’s quirky, well played and fun. There’s some really lovely bass playing in throughout and the blend of Gabriel and Collins’ voices works well. There’s lots of little percussion and flute moments going on in the background with nothing really stepping out and brashly demanding the full spotlight, something which could be said for much of the album. Firth of Fifth is something of a tour-de-force for Tony Banks, starting with a piano solo. The transition into the first verse is an unexpected change of direction, but it makes sense later when the piano intro is reprised later on in the middle instrumental on synthesizer. Before we get to that though there’s one of my favourite Peter Gabriel flute moments, and a beautifully piano build-up. Phil’s drumming is again beautifully complementary to the lead instruments at each stage and to the piece in whole, and then there’s a sublime guitar lead part (it’s not really right to call it a solo in the traditional sense). After a while we realise we’ve come full circle and the vocals make a brief reappearance before another delicately arrange fade-out. More Fool Me. Well… this one gets a lot of negative reception. It’s a Phil Collins vocal piece. It’s not exactly bland, it’s not exactly without merit. It feels a little out of place on the album but I don’t hate it the way many people do, and I don’t skip it, but it is probably for me one of the few areas I think they could have found something better to do. The Battle of Epping Forest is often cited as Peter Gabriel’s characters, lyrics and concepts getting out of control and spoiling an otherwise good track. It’s certainly quite a lot being shoe-horned in but I think the writing of the whole piece, not just Gabriel’s parts, is a more challenging to the listener. When I’m in the for listening closely, it has got some absolutely wonderful lines and interplay and some of the finest drumming I’ve heard from Phil Collins outside of Brand X, but it is unquestionably a more angular, fractured and attention-grabbing piece. My least favourite part is the middle “The Reverend” section though even that is something I wouldn’t say I dislike and at times I enjoy it as much as anything. I suppose the bottom line on this song is that I have to be in the mood for, unlike Moonlit Night, Firth of Fifth and Cinema Show which I could listen to any time. And then there’s After The Ordeal, which provides the sort of musical interlude I strive to put on albums I write to break up the larger, more unwieldy pieces but without ever feeling like a piece of filler which has no merit of its own. The Cinema Show is another absolutely stunning piece of composition and band interplay. Whatever may have happened to the relationship between the band members over time, here they were all having their moments to shine, never at the expense of each other, and often in combination. The piece goes through several vocal sections and different themese before reading, for me, one of the high points of Genesis’s output at about 6 minutes. A classic building section in 7/8 with tasteful synth lead work and then a glorious mellotron choir. And just when you think it will find its way back the verse vocals, you found you’ve been taken down a different road to Aisle of Plenty. More of a musical epilogue than a piece in its own right, it reprises the theme from Dancing With The Moonlight Knight, with some clever lyrical content from Peter Gabriel (actually, the whole album is riddled with word play and clever metaphores and imagery). In any case, it is a perfect ending to a really superb album. I heartily applaud your selections for 1970, 1971 (Salisbury is so often overlooked, but it’s my favourite Heep album by a distance) and 1972 as well – Close To The Edge is a true classic – but how you managed to get each year down to a single album, I have no idea! I have about 25 ‘favourite’ albums from 1971 alone! Jamie, we’ll see what you make of my ’75 choice then. Unfortunately I seem to have lost my carefully made list and will have to start again. No doubt I will pick a lot of different albums this time. I’m always bewildered when people don’t pick this one as the best Gabriel-era Genesis album. It’s got a much broader appeal and sound than ‘Foxtrot’ and it’s pretty much filler free…unlike ‘The Lamb’ which, by comparison, is a giant bloated mess. Yes, I think Foxtrot is excellent and I did eventually warm to The Lamb (which does have some really great moments) but Selling England By The Pound is clearly a masterpiece. Still, everyone has different tastes which is what makes these discussions interesting!